Brian Schneider, owner of Organicare Central Texas, has been a life long resident of Williamson County. Born in Georgetown, Brian, his wife and three children live on a small farm just south of Jarrell. 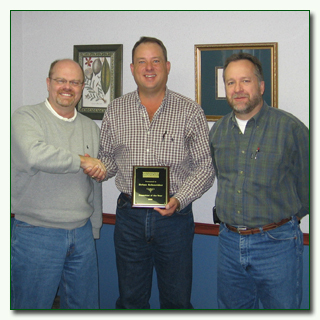 Stewart Hanson, CEO (left) and Shannon Schooling (right) present the 2005 Franchise of the Year Award to Brian Schneider (center) owner of Organicare Texas. Brian has a B.S. in Agricultural Economics from Texas A&M University. 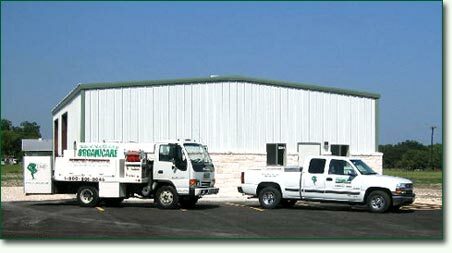 For over 20 years, he has been involved in the Green Industry. For the last 10 years, he was employed with a fertilizer formulator in the Houston area. "My job was to sell landscape maintenance customers a custom formulated product that was based on soil analysis and premium ingredients. Almost all of the time, the owner or manager was only interested in what cost the least. I could not understand why cutting corners were the best thing to do for our turfgrasses. After all, cheeseburgers are a food source." By using his experience, Brian decided to go into business for himself. Organicare Texas fits him nicely. Not only does he use different types of organic formulations throughout the year. But he also understands most of the products on the market. "I also pride myself on customer service. How many other companies can you call and talk to the owner? After all, isn’t this a service business?" Brian looks forward to the future. By coupling his experience and service, the Austin area finally has an alternative to the traditional companies. call us today at 512.931.2320 for a free soil analysis!